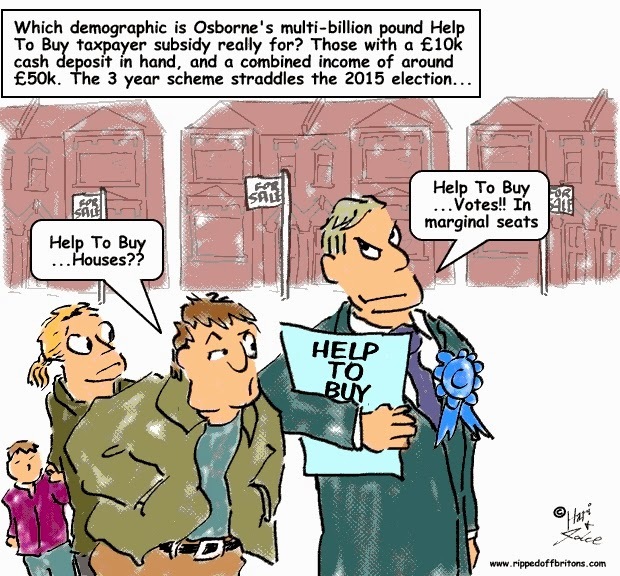 Graphs at a glance: Government's "Help To Buy" won't help those struggling to buy a house. But it will help people with rich parents! Fishermen putting worms on hooks don't intend to be cruel to worms nor do they intend to feed fish. When baiting their lines fishermen care nothing for the welfare of worm or fish, thinking only of their own dinners. So it is with the Conservative’s “Help To Buy” mortgage scheme, which has more to do with where the Tories' next meal is coming from than the welfare of struggling aspiring homeowners. "If we don't do this it will only be people with rich parents to help them who can get on the housing ladder - that is not fair, it is not right." A closer look at the scheme reveals that it is precisely these people with rich parents who will be "helped to buy". 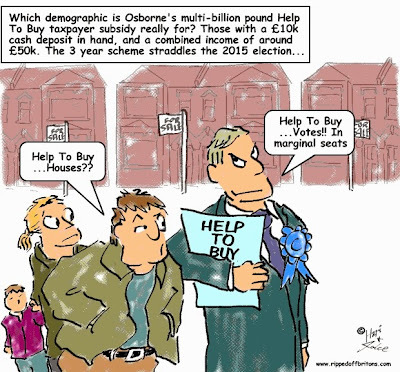 The ‘help to buy’ scheme covers house purchases up to £600,000. Few struggling aspiring homeowners aim so high. According to a House of Commons research note the average UK house price in 2013 was £170,000. The same note states that even in expensive London the average house price was a trifling £330,000 - well below the £600,000 the government is offering. There is certainly a need to help people struggling to get on the property ladder. A report by the Resolution Foundation shows how low-to-middle incomes have become inadequate to buy a home. In 1983 it took 3 years for someone on a low to middle income to save enough for a deposit, but by 2012 it took 22 years! This is confirmed by figures from the Department of Works and Pensions' "Family Resources Survey" showing that between 2002/03 and 2011/12 there has been a particular collapse in those under 35 years of age buying with a mortgage. Clearly the banks too are hoping to hook a few of the ‘dopiest’ lured by the government worm. And for every hooked dope, the Tories hope for the votes of another 10 dopes who have no intention of using the scheme but are bamboozled into being impressed by the Tories apparent help for hard working strivers. If the 'help to buy' scheme was truly aimed at aspiring homeowners struggling to get on the housing ladder it would have a limit much lower than £600,000. According to figures from the Land Registry for June 2013, 93% of all house sales outside London were for less than £400,000, and 63% were for less than £200,000. Outside London a £600,000 limit is fatuous. 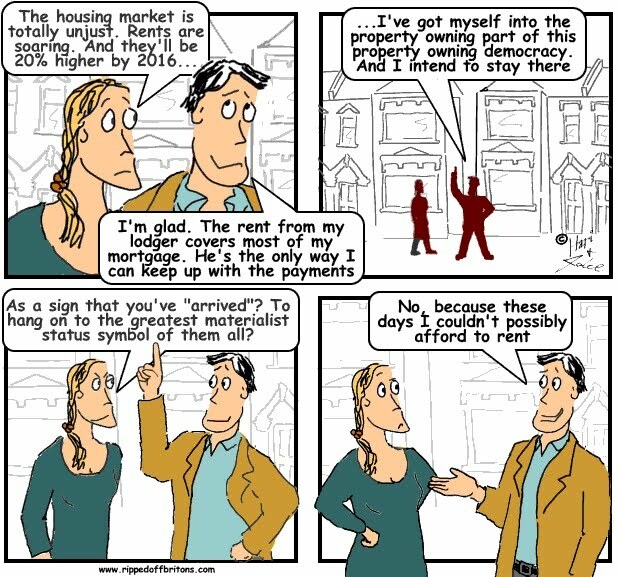 Inside London the £600,000 limit will help fill houses vacated by poor people whose housing benefit subsidy has been cut, with rich people for whom the housing 'help to buy' subsidy has been inflated. The scheme will help wealthy investors buy £600,000 houses. Investors who will be able to speculate on the housing market with 5% deposits buying via their friends and family (the government guarantee is limited to one mortgage per person). Investors can truthfully tell their sons, daughters, nephews and nieces that it is probably cheaper to pay a mortgage than paying rent to a landlord. Particularly in London where the option of social housing is being eliminated. Figures from the Department of Works and Pensions' "Family Resources Survey" show in London the median cost of private rent is double social rent. (For the mathematically less adept, 'median' is an average that filters out extremely high and low values which would otherwise exaggerate London private rents - BBC Bitesize provides a handy school-level explanation). Paying a deposit of just 5% instead of 20% means an investor can invest in four houses with the same money that previously would only buy them one. Four chances in the housing casino for the price of one! The Tories get their dopey voters, the investor gets his houses, and his sons, daughters, nephews and nieces get a cheaper place to live! So everyone is quids in except for the “struggling aspiring homeowners”. For them the resulting property bubble will actually make buying a home even more difficult! You can buy a house in Bradford for under £50,000. And get a pretty good three-bed terrace for £80,000. The same applies in places like Colne, Blackpool, Middlesborough, Liverpool, Hull...the list goes on. But you're in the South East and can only think about the South East. As usual you are wrong as a result. Actually, we agree with you. The article points out that there is no justification for "help to buy" subsidising houses upto £600k. Even in London 'strugglers' won't be buying at that price. There are plenty of houses for 'strugglers' well below that even in London and the South East. The £600k limit 'helps to buy' houses in the names of the friends and family of the well off. Do it. The UK is going down. "Prime Minister David Cameron has said the government will consider scaling back its Help to Buy mortgage support scheme if the Bank of England believes it is inflating a housing bubble, as official data showed an annual house price rise of 17 per cent in London." There is only one reliable way to make more home owners; That is to build more homes! The councils level. If people want to solve the housing crisis they must get involved in local politics and force them to approve suffient homes in your area that you would like to live in. If the homes are undesirable do not be surprised that they are slow to build, as no one wants to live in a small box amoung a council estate and no one will pay for it.instead those how can afford a home will just keep buying existing homes inflating there value and add nothing to supply of new homes. If the homes are more desirable to alternative existing homes; they will sell faster adding to to overall housing stock and help resolve the crisis. We must address the fact that only 10% of home sales are new builds that means that the housing stock never grows fast enough to keep up with household formation. There is another way. Don't build homes where the jobs are, move more jobs to where the empty homes are. Public sector jobs would be a good start.